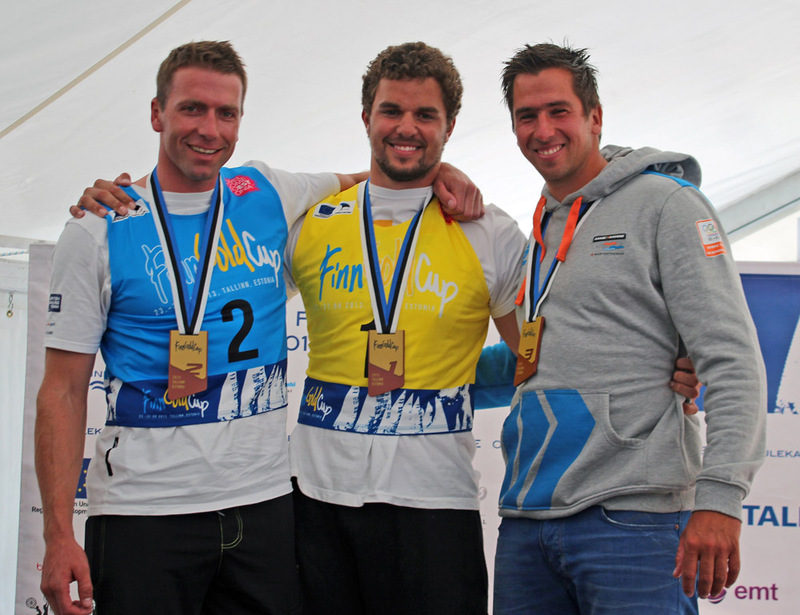 On Saturday afternoon in Tallinn, Estonia, Jorge Zarif (BRA) completed the task he began on Friday and won the 2013 Finn Gold Cup. A ninth place in the medal race was enough for him to become Brazil's first Finn world champion since the late Jorg Bruder in 1972. Ed Wright (GBR) placed third to keep the silver, while Pieter-Jan Postma (NED) won the race to take the bronze. The sailors in the medal race launched on schedule for the first time all week but still, the wind died almost straight away and they sat and waited until past 14.00 until finally a stable breeze of around 6-8 knots became established and the race could start. In taking the bronze a clearly elated Postma has broken a run a fourth places and adds to his two silvers from 2007 and 2011. He said, "I am very, very happy with this. I had quite a difficult week. I had a couple of good races but I was totally wrong a few times, and then it's hard to focus until the end, as I had two bad results making it really hard to get the gold, which is what I wanted. But then you have to be strong and fight to the end, so I am very happy with that. It was a good race." "It's been very light this week. Normally I am not that strong with the light winds as I am 5 or 6 kg more than the others. So I wished for more breeze and then in the light I also performed so I am happy." "It's nice to have a strategy and a plan and even it you are not 100 per cent sure, make a plan and go for it. I had to focus all the race but it came together today." Wright has now been on the podium for the past four years and was also really pleased with his silver medal. "It's been a really, really tricky week without much wind, so just keeping focus with all the waiting around has been very important so that you're ready to race when you do go out there." "The medal racing today was pretty stressful and not that enjoyable. It was all pretty close. My goal here was a top three finish and of course you would always prefer to win, but I'm happy with silver after the week we've had. Things would have been a lot closer with the Brazilian if I hadn't had my OCS yesterday." "This week has been really good for me as I'm mainly known for my strengths in the strong winds, and this week has been really light. I've lost weight and trimmed down a lot of my equipment for this season to be more competitive in the light winds, which we expect more of in Rio, so it's great that that seems to be paying off and that I'm back showing more of the light wind form that I had when I first came into the class." The new Finn world champion, Zarif, said "It's feel great, fantastic. I couldn't be happier. I tried to stay outside the action but it was hard sometimes. I tried to start a little bit after the guys and played the right because you can come back with rights, and in the end everything went quite well." "I am surprised we actually raced. Three or four times we had some puffs because of the clouds, so I thought when the wind came it was just another puff, but it got a little bit stronger and was sailable." "I think this will have a big effect back in Brazil. There is much more money around because of the Olympic Games so I hope with a world title they can support me a little bit more." 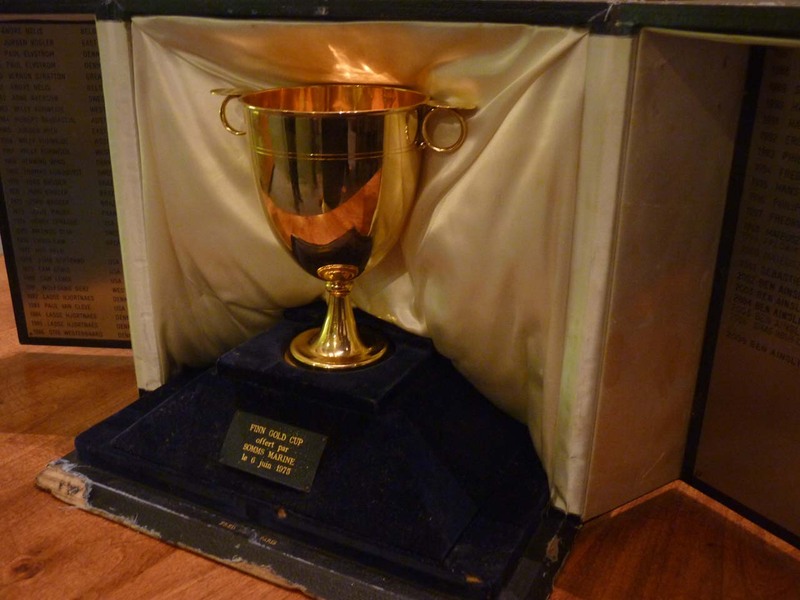 "I had no idea that I would win the Finn Gold Cup. I want to thank everyone who helped with this championship, the competitors and organisers. We didn't have the best wind we could have but the organisation and the hospitality was fantastic here in Tallinn, so I would just like to thank everybody." Zarif also won the juniors. The top five were Zarif, Jake Lilley (AUS), Arcadiy Kistanov (RUS), Peter McCoy (GBR) and Riccardo Bevilacqua (ITA) - see photo. After finishing 20th in the London 2012 Olympics Zarif went back to Brazil to recover and think about his next move. The removal of the Star class was instrumental in him teaming up with multiple world champion and Olympic medalist Bruno Prada (BRA). Prada asked if Zarif wanted to just take part at the next Games or win a medal. Zarif said he wanted to win a medal, so they started training together. They employed the services of former world champion and 2004 Olympic Silver medalist Rafa Trujillo (ESP) and the training began. Trujillo thought his young apprentice could could place top ten this week, but it seems Zarif didn't want to wait and had all but confirmed the title before the final race. The medal race was a mere formality. Jorge Zarif (BRA) is within a whisker of winning the 2013 Finn Gold Cup after an outstanding performance on Friday, including winning the first race of the day. Ed Wright (GBR) moves up to second with Jonathan Lobert (FRA) in third. The other two races were won by Wright and Pieter-Jan Postma (NED), who climbs to fourth. Only the medal race and the final race are left. The day began as expected with no wind and fog and warnings from the PRO of a long day ahead. However the air cleared, a breeze began for form and the sailors were sent out at 13.00. Thursday's pessimism came to nothing as the sailors were rewarded with three good races on Tallinn Bay, with winds reaching 8-10 knots, as well as patchy rain towards the end of the day. Miraculously, all three races got away at the first attempt, though there were OCS boats in each race. Lobert's and Postma's good form pulled them back into contention, while some of the other early leaders struggled and dropped. The leader going into today was Andrew Mills (GBR). His best result of the day was 26th, as he struggled to find any of the form of the early races, and he has dropped to eighth overall. Zsombor Berecz (HUN) also had problems and dropped to ninth, while Vujasinovic just stays in touch in fifth. Junior left it to the last minute to drag himself into the medal race with his second place. Lobert summed up his day, "It was a very difficult day again, very shifty. In the first race I didn't manage to start properly because of a boat beside me who got a penalty. Then in the other two races I got good starts and managed to be on top on the left to be there at the first mark. On the third race I found a hole downwind and I lost some places, but I finished top 10. I am a little bg disappointed because it is not possible to win any more. That's a shame but when it's tricky, you never know what can happen. But Jorge sailed well, so well done to him, and tomorrow I look forward to fighting with Ed to get the second place, and of course, PJ again." Postma climbed 10 places today to be in with a shot at a medal. "It was a tricky day with the left paying all day today. But still there were a few clouds you had to watch. In the last race I started at the boat end and crossed the whole fleet to the left and then played the left. I was about tenth at the top mark and then third at the bottom. I chose to play the left again but the second half of the fleet had to play the right because of this big cloud and we could cut this cloud before the top mark. The Greek sailor passed me to round the top mark ahead but I was faster downwind. I ended up winning the race so I am happy with that." "Tomorrow I will be full-on. We are four guys who can win two medals. So I'll put all the cards on the table and we'll see." He concluded, "A medal tomorrow will make me happy," reflecting on a string of fourth places in recent events. Zarif, who is just 21 and won the Junior Finn World Championship in July, has sailed his best regatta ever including winning two races. He said, "I couldn't imagine this happening, assuming I finish tomorrow. I think the company of Rafa and Bruno has been crucial to this." "It's really different to be top 30 or top 10. I think this time with them has helped me to change a little bit, to change my head. I am using the same boat and mast as at the Olympics, with just a few modifications to the sail. Before when I had a good race it was, wow I did well, and I think this time with Rafa [Trujillo] and Bruno [Prada] it starts to get more normal. Today after the second race I didn't know I was in front, Rafa didn't tell me. Everything was just normal. And this made the difference." "I think Friday was the best day of the sailing here in Tallinn. It was really shifty, the conditions were very hard but the wind was stronger than the other days. You had to work a lot with the shifts and that was the key to the day." His coach Rafa Trujillo (ESP) said, "We still need to finish tomorrow, but it's really great. I was more nervous than him all day I think. Since the beginning of the championship, I knew in these conditions he could make top 10, but I didn't want to say that to him as he is still so young, but after seeing him leading the second race of the first day and being so steady in this wind, I talked to him about a target of being top 15 each race. It's amazing. It's been really difficult conditions, and good racing. And if it was windy I think he would also be competing to win because he is now a good all round sailor." The championship concludes Saturday, with the medal race for the top ten at 12.00 and the final race for the rest at 13.00. Zarif just has to finish the medal race to take the title. Theoretically seven boats can take the other medals, so that should be a battle worth watching. The racing can be followed online in a number of different ways including the live video stream from ERR, GPS tracking from Trac Trac and Twitter updates on @Finn_Class. For the third day in a row an early postponement was hoisted at the Finn Gold Cup in Tallinn, Estonia, but unlike the first two days, the wind never built enough to start racing. Racing for the day was abandoned at 15.00. The early morning wind was offshore, and it took some time for the developing sea breeze to kill this off, but when the sea breeze arrived it struggled to increase to more than 5 knots. The sailors were held onshore under just AP so they could be ready to go as soon as the wind arrived, but by 15.00 the PRO made the decision that it wasn't going to happen, and abandoned racing for the day. In his first year in the Finn Milan Vujasinovic (CRO) is exceeding his expectations, sitting in fourth place after four races. He said, "I am happy so far with my performance. I was looking forward to some lighter winds because I am not at Finn weight yet and just came to the class this year. So I am more happy with lighter winds than strong winds." "I am also pretty happy with my mental preparation for this regatta, which I think has been most important. These are really difficult conditions." "I am a bit surprised by my position so far. My goal was top 15, which would have been a big success for a first year, but so far it is looking good. It's only been four races so far and we all know it's far from over. I am feeling comfortable in strong winds but so far the forecast is not saying that, so I am happy so far." But all are happy to be in Tallinn. John Bertrand (USA), the Australian coach said, "I hadn't really thought about it much until I got here this year. I really love Tallinn for obvious reasons. It's a great place to sail, and the Estonian people are wonderful. It's been really nice coming back and an opportunity to maybe close that chapter." The Canadian coach Larry Lemieux (CAN) added, " I think partly I agreed with it at the time a little bit because I was so ignorant, but I was just a young kid. In the Olympics your window of opportunity to win a medal is not that big in a sport that is athletic. So that would have probably been one of my best opportunities to win a medal." "But I am really pleased to be here after so long. Now I see what the conditions are like here and everything else, it would have been great." Lemieux did four Olympic campaigns, but hasn't raced for several years. "I'm not so keen on getting back into competition any more. When you've done it for so long, your body starts to get accustomed to reacting in a certain way to stress, and it's almost an automatic reaction. Even when I've tried to do just a fun regatta, those feeling still come, and I just don't like that. I used to get the same reaction from coaching, when I first started. I was nervous for them. I'd feel the stress before the race started. It's really weird how that happens. I did the Finn Masters for a while, and the last couple of times I did it, after the first day of racing I'd just be thinking I can't wait for it to be over. That s not the way it should be be. You should be looking forward to it and excited to race. I just don't have that desire any more and I think it's because I did it so hard for so long." Despite the lack of wind, it was another beautiful sunny day in beautiful Tallinn, and the mood of the sailors was good despite the lack of racing. Tonight a barbecue is being held in the regatta centre overlooking the harbour. Racing continues, wind permitting, at 12.00 on Wednesday. The opening series of ten races will be followed by the medal race for the top ten and the final race for the rest on Saturday, 31 August. It can be followed in a number of different ways including the live video stream from ERR, GPS tracking from Trac Trac and Twitter updates on @Finn_Class. In conditions very similar to Monday's races the fleet was again held on shore for two hours for the wind to build. The wind turned up again, but was still not more than 7-8 knots at any time and still very unpredictable, causing a string of high scores throughout the fleet. The results make for interesting reading with a huge number of different names near the top, with many of the favourites struggling down to mid-fleet. Regatta leader, Andrew Mills (GBR)) crossed in 15th after rounding the first mark well placed, as he slipped back slightly. However in the second race, he made amends, starting near the pin and tacking across to the right to lead at each mark for the whole race. He rounded the top mark ahead of Michal Jodlowski (POL) and Milan Vujasinovic (CRO). Many of the overall leaders were deep in the fleet again. Postma described his day, "Before the start, the wind shifted a little bit left and so I went to the left side of the line and I won that side, and then I could take the shift and I was leading straight away. The fourth race was not a good race for me. Again the wind shifted left at the start but farther than the whole day so I started on the right side and I thought it would shift back but it only shifted more left so I was taking the long way and had a bad race." Junior scored a 2, 11 today and moved up to 15th overall. He said, "Another glamour day with five knots and the shifts continued, but instead of the right paying like yesterday, the left paid. I was pretty lucky and found myself out on the left and managed to get a second in the first race and a 12th in the second, so I'm pretty happy. It's plenty tricky and it's really hard to predict what's going to happen as you can't really see the pressure, so all you can do is get a good start and play the percentages and work your way up." Mills said, "Another tricky day. It was just about trying to get two consistent races, maybe top 10s. Light winds is not traditionally what I am good at but I seem to be doing OK here. But it's a long way to go, with seven races left." "The last race was tight, with a black flag and a lot of people pushing the line at the pin. I lined up with a few seconds to go and was perfectly covered and found a wave to surf out of the line. I hit that perfectly. From there I was well punched, tacked on the shifts and got a decent bit ahead. From there it was just sailing, as I was confident I was in the top two from five minutes out." After an indifferent Monday, Greg Douglas (CAN) had a better Tuesday with a 8, 13 to move up to 13th overall. He said, "It was another lovely summer day in Estonia with a light, tricky breeze which made for some interesting racing. As always the boys were eager to get off the line so we had a few recalls which made for a slow start but we got away and had two great races." "Being consistent and keeping your head out of the boat really paid. There was more wind in the second race which stretched the fleet out a bit more, which was nice so the marks were less crowded and made the racing easier and more spread. Racing continues at 12.00 on Wednesday. The opening series of ten races will be followed by the medal race for the top ten and the final race for the rest on Saturday, 31 August. It can be followed in a number of different ways including the live video stream from ERR, GPS tracking from Trac Trac and Twitter updates on @Finn_Class. Po dwóch wyścigach Anglicy na prowadzeniu: Andrew Mills (GBR85) i Ed Wright (GBR11). Trzeci Matt Coutts (NZL). Na czwartym wysokim miejscu witamy Michała Jodłowskiego (POL13). Michał zajmując dwa razy dziesiąte miejsca z wynikiem 20 punktów jest czwarty w klasyfikacji. Jutro kolejne wyścigi. The 2013 Finn Gold Cup in Tallinn, Estonia was opened Sunday night amid a spectacular location with outstanding hospitality, beautiful singing, great food, and a moving presentation to one of the absolute class legends. As soon as the Finn sailors arrived in Estonia, they knew they were in for something special. Tallinn Bay has a long history of Finn sailing and the idyllic conditions over the past few days have enamoured the whole fleet to the beautiful area. Sailors have been training here for many weeks and have come to love the town, the culture and the people. It is an inspiring place to be. The opening ceremony did nothing to dispel this impression. A special open top bus service was laid on to transport the sailors from the club to the Seaplane Harbour (Lennusadam) a maritime museum of epic proportions and ambition that both surprised and amazed in large doses. There was a typically warm Estionian welcome by the President of the Estonian Yachting Union, Mr Andrus Poski, the Vice Councillor of the Minister of Culture, Mr Tȏnu Seil, and the Race Director Mr Ants Väinsalu. Mr Balazs Hajdu replied for the International Finn Association before the championship was declared open, in Estonian, by the Mayor of Tallinn, Mr Edgar Savisaar. This was intermixed by performances by the beautiful and talented Estonian singer Liis Lemsalu. The other highlight of the evening was the award to Gus Miller (USA) of a Medal of Honour from the Estonian Yachting Union. Gus Miller has befriended, supported, encouraged and coached Estonian sailors for more than 30 years after first coming to Tallinn for the pre-Olympics ahead of the 1980 Moscow Olympics. The full story of his involvement with Estonia will be published later this week, but his impact on the development of Finn sailing in Estonia is immeasurable and tonight the Estonians said thank you. In presenting the award, Ants Väinsalu said, "Before we proceed to the Gold Cup racing one very important thing needs to be done. There is one very special person among us right now who has done an incredible amount to help Estonian sailing and Estonian Finn sailors. For almost 40 years this man has been our friend and active promoter. Already in 1978 he wanted to bring the Gold Cup to Estonia. Politics made it impossible for 15 years, but in 1994 his dream became true. He has provided valuable help, advice and support to many Estonian Finn sailors over decades. 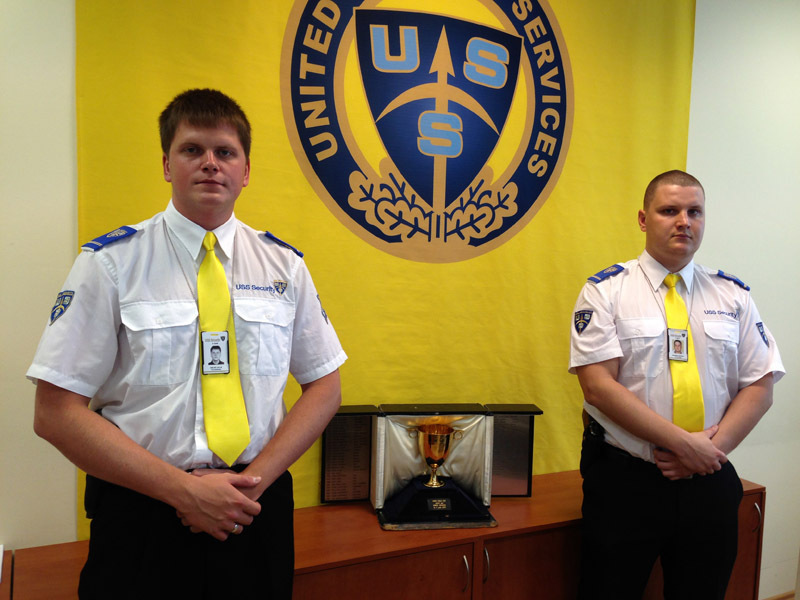 He also had a big part of bringing this 2013 Finn Gold Cup to Tallinn. Without him Estonian Finn sailing would not be what it has become. 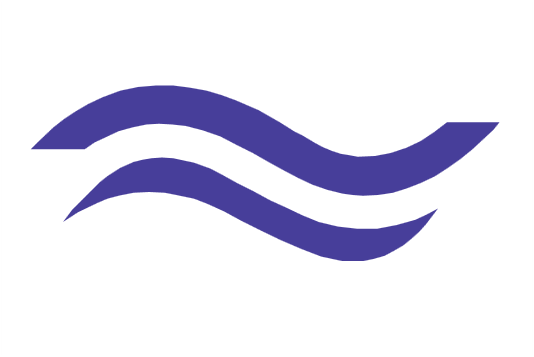 For his outstanding contribution to Estonian sailing, the Estonian Yachting Union has decided to award him the official Badge of Honour." Miller said, "This morning I woke up about 4.00, maybe excited by the racing, but thinking back around 35 years of coming to Estonia. When I first started travelling internationally I made a rule for myself that I would allow enough time that I would spend 50 per cent of the time away from yacht club, away from the Finn and away from the race course, getting to see new places and new people and to learn from them. When I think back to those I met in 1978 when I first came to Estonia - back then it was the Soviet Union - I did not realise Estonia was not Russian. It didn't take long for the difference to be explained to me. The people I met and the influences from my first time here had a great impact and brought me back many times. It's been a great adventure. I see old friends here, I recognise the face, but not sure I remember the names but it is great to see them and it's wonderful to be back here." At the end of registration 95 sailors from 30 nations are entered, making this the largest Gold Cup fleet for nine years. About 25 of them made it out to the practice race on Sunday afternoon, which was a short affair. The fleet got away first time in a light offshore breeze in some nice sunshine and sailed the first leg before heading for home. Andrei Gusenko (UKR) led Matts Coutts (NZL) and Josh Junior (NZL) around the top mark after a sizeable right hand shift that eventually led the PRO, Madis Ausman (EST) to abandon the race. On Saturday night the class held its international Annual General Meeting, which is always a lively gathering. The assembled sailors heard about the ongoing development of the class both numerically and technically. Discussions centred around use of new technologies and controlling the existing construction materials as well as clarifying hull local reinforcement and using flags at Finn major events. The meeting heard that the process of inspecting new moulds before they went into production was working well. Future development such as the introduction of moulded sails, carbon booms or the use of basalt fibre was thoroughly discussed but not adopted. The meeting also confirmed that the London 2012 bronze medalist, Jonathan Lobert (FRA) would join the Executive Committee as Vice President Development, replacing Zach Railey (USA). Pieter-Jan Postma (NED) was also congratulated on his appointment to the ISAF Athletes Commission. Then voting took place for future events with the 2015 Finn Gold Cup going to Takapuna, New Zealand and the 2015 Europeans returning to Split, Croatia. Split is a regular host for Finn championships, while Takapuna last hosted the Finn Gold Cup in 1980, so a return to New Zealand is long overdue. Regarding the 2016 Olympic Games, the meeting recommended to keep the existing format while trying to further improve the presentation of the sport. The decision was also taken to recommend to ISAF to allocate one place per continent, in order to support the Finn development progress across the world. After three years of planning, and weeks of preparation, the 2013 Finn Gold Cup is ready to start on Monday 26 August. The opening series of ten races will be followed by the medal race fot the top ten and the final race for the rest next Saturday, 31 August. Racing begins at 12.00 on Monday. It can be followed in a number of different ways including the live video stream from ERR, www.finngoldcup.org/2013.and Twitter updates on @Finn_Class.